If you’d like to participate in the planning process, you can contact Ms. Davis at ndavis@savethesound.org. The sign-in sheet was passed around. Board members and those in attendance introduced themselves and stated which street they live on. Treasurer Deb Weckerle said all members will get a membership card, most likely in March. Announcements. Dave let people know about the Family Library event coming up at the library in February. The second Booze and Books library fundraiser will be held on April 27, as well as another Evening in the Stacks event to be held at a date to be determined soon. Janet Kazienko announced that the Music Committee will be meeting at 7:30 next Monday. Dave mentioned that local postman Dave Misthal is retiring and there’s a party for him on January 31 at the Playwright at 6 pm. If someone breaks into your car but doesn’t steal anything, you should still inform the police. Detective Sean Dolan was introduced as the officer in charge of the block watches. Stay in touch with him as he follows what’s going on the neighborhood. Stay in touch with what’s going on through the Hamden Police Department Facebook page. Don’t fall for scams. If there is a scam going around, let the police know so they can track it. Keep an inventory list of items in your house, take pictures, and it is much easier for the police to help in case of theft. Most stolen items end up in pawn shops, and serial numbers can help with easy identification. Always lock your car. Bring valuables inside. Deterrence is the first step in reducing crime. Exterior cameras can be especially helpful. Having exterior lights on is great, but motion detector lights are very effective. Cathy told a story about a neighbor who used an anonymous tip line that led to an arrest for breaking and entering. She mentioned Reports.com as a good resource. Detective Dolan said that’s good for following up on finding out what may have happened on your street if you saw police cars but don’t know what had happened. You can either call anonymously or come to the station, but communication is key. Cathy said her neighbors sometimes expect her, a block watch captain, to call about their crimes. She also said that ever since she went through the Hamden Police Citizens Academy, she is more likely to call the police if she has seen something suspicious. Dolan said the police are always looking for people who want to form block watches. Is there anything that can be done if a junked car has been left on the street? Yes, the police can look into it, and if it is there illegally, it can be “red-tagged” and towed. Laine Harris asked if the police can do anything when a commercial or municipal neighbor dumps the snow from their property, sometimes across a road or highway, onto your property. Sgt. Testa said he wasn’t sure but it could be an infraction which would lead to a ticket. The best option is to try to talk to whoever is paying the snow removal contractor. Leaving a television on, with a timer, can make your house more secure when you are away on vacation. Introduction of Justin Farmer. Justin Farmer, Whitneyville’s new representative on the Hamden Legislative Council, thanked everyone for their support and spoke briefly about his goals for the year. State Budget Update. State Rep. Mike D’Agostino said many of the progressive budget ideas that the WCA and he wanted to see enacted this year will not be enacted due to partisan gridlock. One issue was the car tax. Towns can now bill 39 mils for car taxes but no more than that. And the state was going to reimburse the difference the maximum car tax and a municipalities actual mil rate, but will not because of nonspecific budget language and state budget shortfalls. For Hamden, that’s a loss of $2 million. Efforts are being made to fix the budget language compelling the state to release these funds. Contact your representatives and Sen. Martin Looney asking them to fix the car tax issue. Halting all transportation projects in the state: Why is Governor Malloy doing this? The transportation fund is taken from the gas tax, but the money coming in from the gas tax has gone down due to lower usage of gasoline. Can instituting tolls help? Yes, but most politicians, especially Republicans, don’t want to introduce new taxes, but Mike finds this attitude highly frustrating. He wants the leadership to at least call for a vote. He believes that will happen this year. Adding factors like special education and ELL (English Language Learners) into the state budget education formula now has a lot of momentum in Hartford. Towns can bring forward a legal argument that their educational funding is not constitutionally adequate. 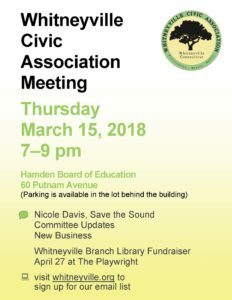 Hamden is certainly in a position, due to decreases in funding, to make that argument. The ECS (Education Cost Sharing) formula was changed somewhat this year to recognize that all towns do not need a share of ECS, or do not need the same amount per pupil. A town like Hamden certainly needs more per pupil than Greenwich does, largely due to special education, ELL, and a roughly 50% free or reduced lunch population. Adjournment. Dave thanked the guest speakers and adjourned the meeting at 8:45. 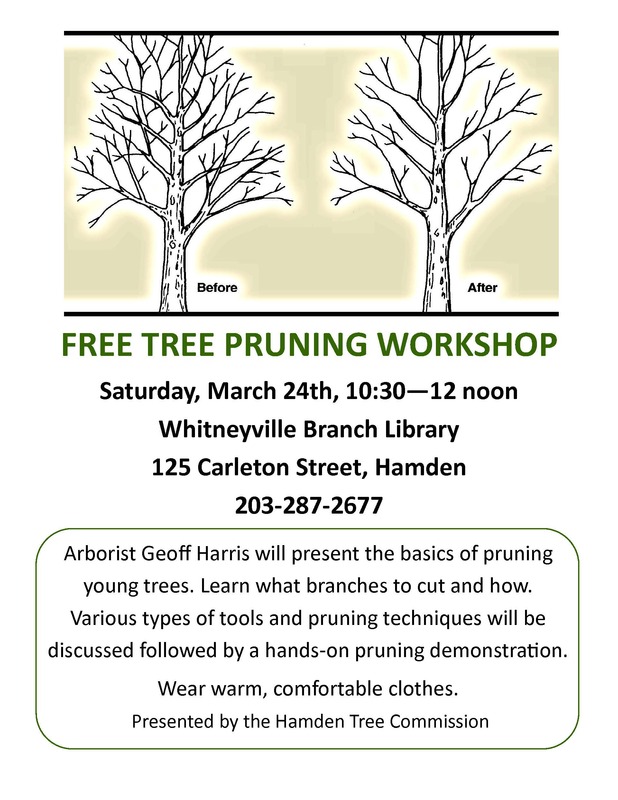 The Hamden Tree Commission is presenting a Free Tree Pruning Workshop on Saturday, March 24th from 10:30 am to Noon at the Whitneyville Branch Library, 125 Carleton Street. Celebrate TAKE YOUR CHILD to the LIBRARY DAY with award-winning author and illustrator Deborah Freedman! 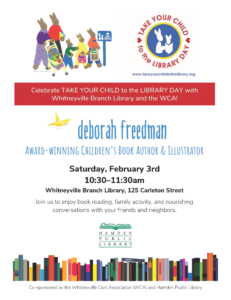 Join us for book reading, a family activity, and nourishing conversations with your friends and neighbors. 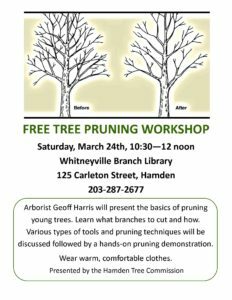 Book reading, family activity, and celebration of National Carrot Cake Day! We hope you can attend this free family event to celebrate our local authors and local library!